It's Thanksgiving week — one of the busiest travel weeks of the year. And like many other years, there's a massive storm on the doorstep of the nation's northeast major hub airports that could send everyone's plans right to hell. But to help you be prepared, here are some of your options to get back on track. When a flight is canceled, the first thing many people do is jump right in line at the customer service podium at the gate from which they were flying. And while the frazzled customer service agent working there will be able to help you at some point, you have other options. Any customer service agent at any gate can help you. Their computers are all networked. If you see an empty line, or a shorter line, get in it. Here's an even better idea — if you're traveling with a few other family members on the same reservation, disperse each person to a different line, then have them text the group when they get to the front of the line. If you're flying solo, you still have other options. First, find the shortest line and get in it. Your best option is always to talk to somebody there at the airport, because they're right in front on you, living the same nightmare, and they want to get you out of their face as quickly as possible. Once you're standing in line, call the reservation line for your airline. If they answer the phone before you get to the front of the line, you win. Pretty much every airline is on Twitter these days, but I don't recommend depending on their help in a timely manner. Twitter feeds are managed by the communications folks, not reservations. So if they aren't already running on autopilot for the holiday, they're going to have to contact the same people you're trying to get ahold of on the phone. Getting a helpful response via Twitter will probably take even longer than standing in line at the airport. Do check your airline's Twitter before going to the airport, because (if they're good at what they do) they should be posting information regarding operational delays. 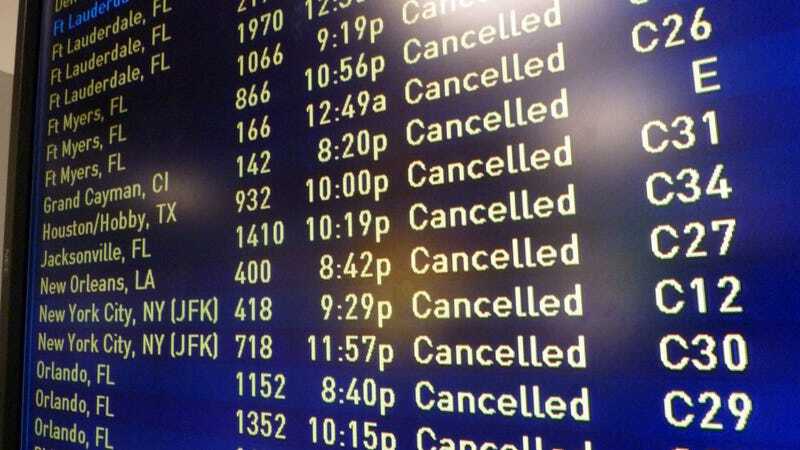 The day of your flight, check the status of your flight on your airline's website. If it's showing a delay, get to the airport as if it's not delayed. I can't stress this enough. DO NOT factor the delay into your arrival time at the airport. I've seen countless incidents of where a delayed flight has all of a sudden bounced back to its original departure time, or at the least, a shorter delay. The airline can swap in another plane on your route, or that ground stop may suddenly be cleared. It happens all the time. If you plan the delay into your airport commute, your flight is long gone by the time you get to your gate, and it's not the airline's fault. The FAA's delay information site covers the country's largest airports. Perhaps it's sunny and warm where you live? Stay there! Just kidding. But it's a smart idea to check the weather where you'll be flying to, or even the weather along your route, because that can also effect the timeliness of your flight. My favorite weather site is Weather Underground, because you can access real-time info from weather stations. You can also check the FAA's Delay Information site, which is also updated constantly. It shows weather disruptions as well as those one-off incidents like a fire in an Air Traffic Control center. Cancelations can and will happen. Nobody likes them. If your flight does get canceled, don't take out your frustration on the person behind the counter. For one, they're a lot less likely to give you what you want when you're yelling. If you're super aggressive, or smell like the booze you've been pounding during the delay, they can have you escorted out of the airport and you won't be flying anywhere. This holiday season, take a Shakespearean approach to your travel and remember "To be, or not to be." To be late to the airport, is not to be at Grandma's house for the family feast.